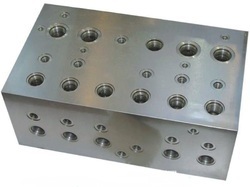 The custom machined manifolds are manufactured at our factory and feature a variety of intersecting holes, internal NPT threads and engraving using latest tooling’s. We can machine a wide variety of custom manifolds out of a variety of materials for a variety of industries. Sizes: custom design as per requirement. 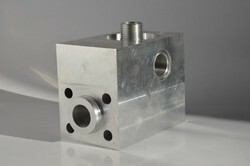 We can manufacture small to large manifolds. Material: Stainless steel, ductile iron, brass, plastics. Our advanced CNC milling and machining capabilities, full assembly services, and state of the art CNC services allow us to provide full service machining for manifolds intended for a variety of applications. The custom machined stainless steel manifolds shown above were machined in small quantities for the OEM industry. The custom machined stainless steel water manifolds shown above are machined in small quantities for the conveyor and belting industry and are made to custom order. The new device in this series comes in a compact and lightweight construction, being made of anodized aluminum. The manufacturer provides through holes that are suitable for mounting, along with four standard sizes. The 1/4" NPT gauge port is a standard one, with MBC series, while the adapter plate allows mounting on flat surfaces for all manifolds. Precise, professional installations are made easy with this device, while the quality manifolds were designed for efficiently distributing connections in the case of medium pressure or vacuum systems. Looking for Pneumatic Manifolds ?